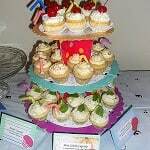 Last year for New Year’s Eve we had a party and I made a ton of desserts including a trio of boozy cupcakes. People really enjoyed them and I had fun making them. However, they were time consuming and I ended up having 6 dozen mini cupcakes for the party. This year we only had a few people over and while I wanted to make cupcakes, I only wanted to make one type so I wanted to make it a good one. When I’m looking for baked goods I often go over to Sprinkle Bakes. Heather, who is the genius behind Sprinkle Bakes, not only has amazing baked goods, she decorates them beautifully as well. 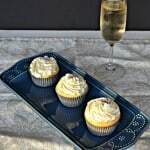 I found a gorgeous champagne cupcake. Can you imagine anything better for New Year’s Eve? They were amazing. 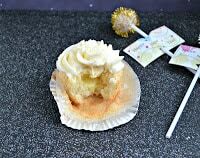 The cupcake was dense and delicious then filled with champagne pastry cream. 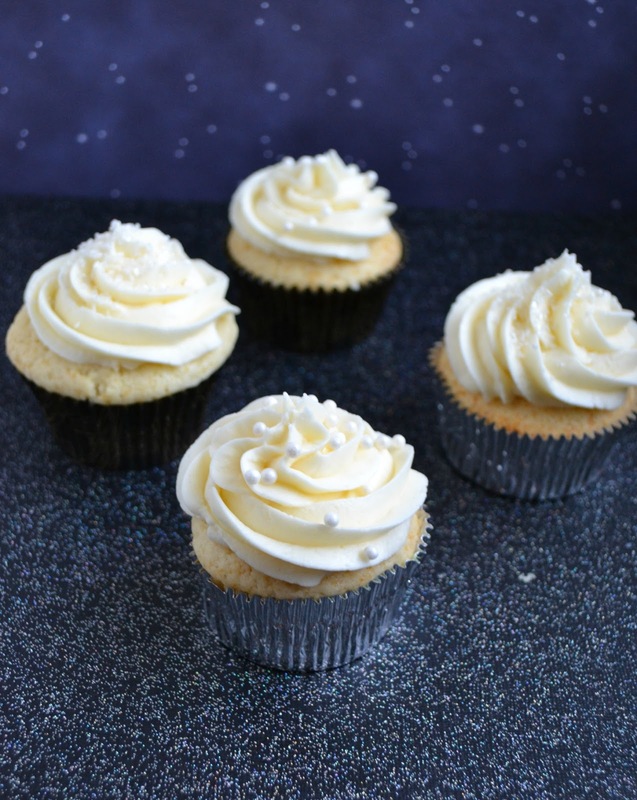 It was topped off with a sweet champagne buttercream. The entire cupcake was pure bliss. I decorated it with the frosting and then added a few edible pearls. While the cupcake was beautiful as is I felt it was missing something. The cupcakes were missing cupcake toppers. I made them out of lollipop sticks, scrapbook paper, and metallic pompoms. 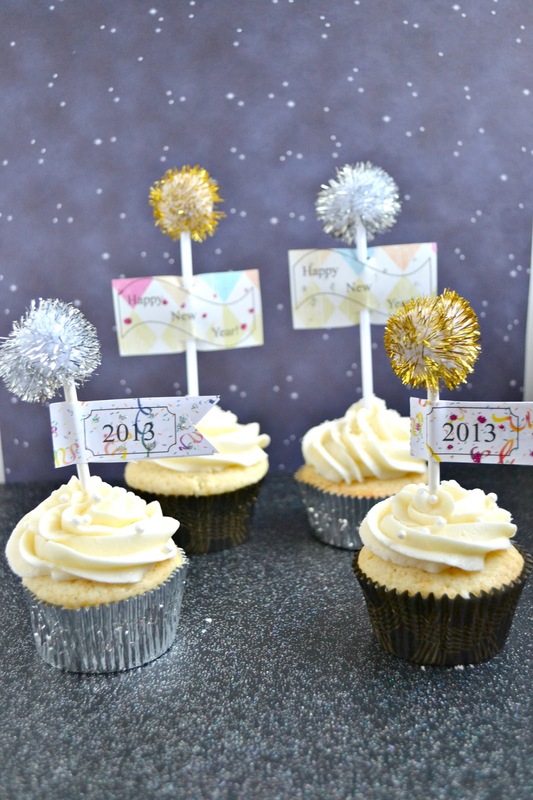 Then I added glitter because it was New Year’s! They turned out to be fabulous. Everyone who ate one absolutely loved them and they paired wonderfully with a glass of champagne. These are definitely a special occasion cupcake and I can’t wait to make them again! 1. Preheat the oven to 350 degrees. 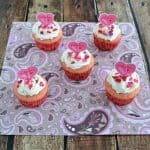 Line 2 muffin tins with cupcake liners (this will make 16-18 cupcakes). 2. 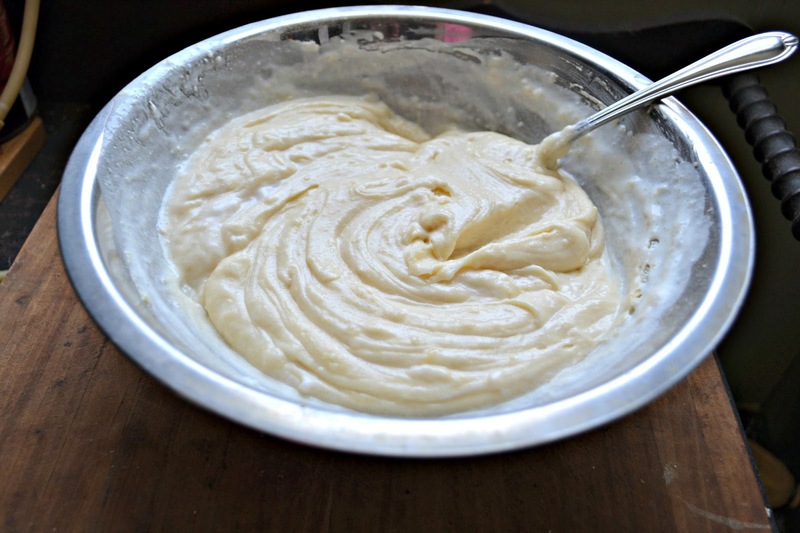 In the bowl of a stand mixer cream the butter and sugar until light and fluffy. Add the eggs in one at a time. Add the vanilla and mix. 3. In a medium bowl combine the flour, baking soda, baking powder, and salt. Set aside. 4. In another medium bowl whisk together the sour cream and champagne. 5. Add the flour and champagne mixture alternately to the sugar mixture. Mix well. 6. Fill the cupcake liners 2/3 of the way full. Bake for 18-22 minutes. Remove from the oven, remove from the muffin tin, and cool on a wire rack. 7. To make the pastry cream whisk the cornstarch and 1/4 cup of heavy cream together in a medium bowl. Beat in the egg yolks. Set aside. 8. Combine the remaining heavy cream, sugar, and champagne in a medium saucepan. Bring the mixture to a boil then remove from heat. 9. Pour 1/3 of the boiling champagne mixture into the egg mixture, whisking constantly so the eggs do not cook. Return the champagne and heavy cream mixture to a boil. 10. 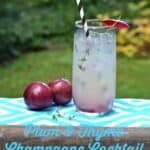 Pour the hot egg mixture into the champagne mixture slowly, whisking constantly, for 2 minutes or until it thickens. Remove from heat and stir in the butter and vanilla. Cool for at least 10 minutes. 11. 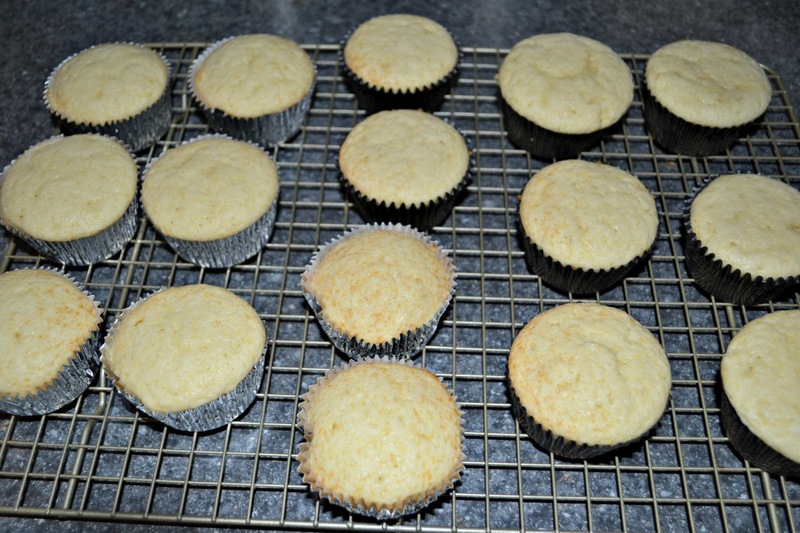 Cut a round divot in the top of each cupcake and fill it with the cooled pastry cream. 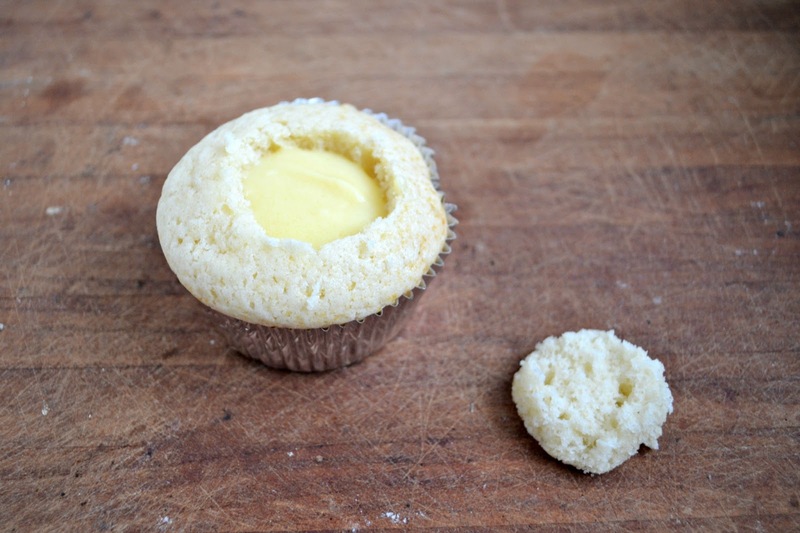 Trim the cut out cupcake piece and place back on top of the pastry cream to make a lid. Set aside. 12. To make the frosting place the 1/2 cup of champagne in a small saucepan. Simmer over medium high heat until it has reduced to 2 tablespoons. Pour the reduced champagne into a small bowl and let cool for at least 15 minutes. 13. 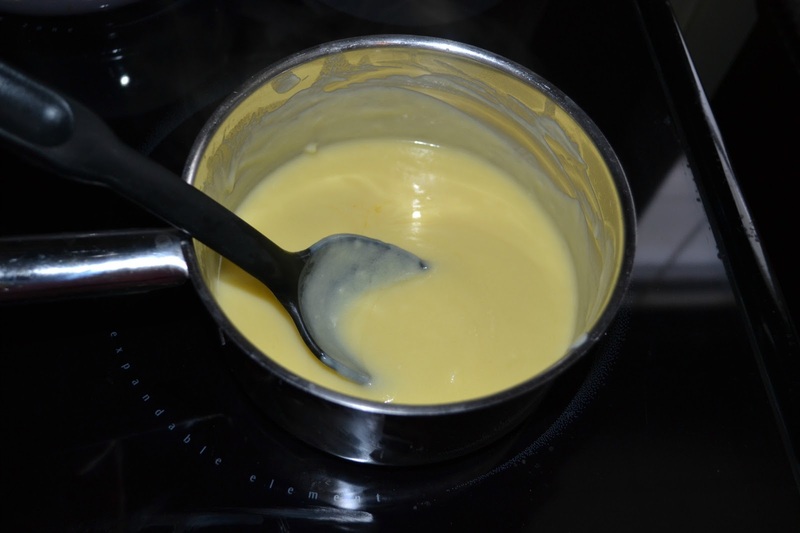 In the bowl of a stand mixer cream the softened butter. Add in the powdered sugar and beat on medium high speed. Add in just enough water to form a thick frosting. Pour in the cooled champagne plus the remaining 1 tablespoon of champagne and mix well. 14. Use a large piping tip and frost the cream filled cupcakes. 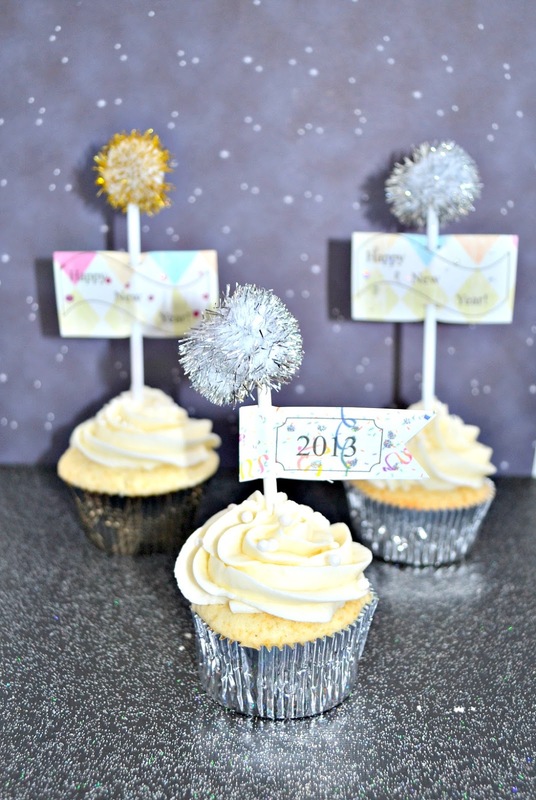 Decorate with edible pearls, edible glitter, or cupcake toppers. Thanks for sharing this with us at Foodie Friends Friday.